Well, not quite, but the latest update from Apple might as well be a new watch. The new operating system, watchOS 3 is one of the best operating system updates I’ve ever seen in the 18 years or so since I’ve been interested technology. There was a time when a new OS update meant inevitable slowness until you finally succumbed to the marketing and upgraded by either stuffing more RAM into your PC, or shelling our for a brand new machine. This changed in the PC world with Windows 7, which famously had the same operating requirements as it’s then 2 year old predecessor, Windows Vista. Apple hasn’t always been so kind, with new versions of iOS regularly slowing down older hardware, though this hasn’t been so much of a problem since the 64-bit era (2013 iPhone 5S or newer), but even now an iPhone 6 doesn’t feel as snappy as it did 3 years ago. So it was a nice surprise when Apple announced back in June that its latest incarnation of the operating system for the Apple Watch, watchOS would be focused on performance. This was long overdue. Apple Watch’s main failure was it’s slowness. Unlike a laptop or a phone, a slow smartwatch can be physically painful to use. So for the most part people didn’t it seemed – 3rd party apps were few and far between. The new version of watchOS achieves this speediness by keeping apps in memory for as long as it can. You now get to choose your 10 favourite apps and place them in a ‘dock’, and they’ll be prioritised over other apps to not only stay in memory but also receive more frequent background updates. 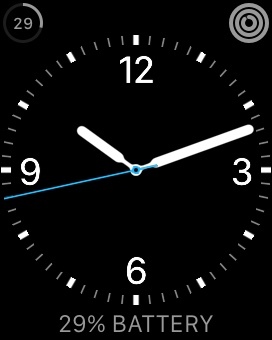 Frequent background updates also apply to ‘complications’ (widgets on the watch face). What is striking though is the amount of fit and finish that’s been applied to the system. Now apps do really launch instantly, for the most part. If like me you only use 4 -5 apps of a regular basis, then it’s likely those apps will always be in memory. This results in a much more usable device. Siri, the voice controlled virtual assistant is now much more efficient at communicating its status as when you ask for something. Instead of having to watch your wrist to see if it managed to understand what you said, you can now drop your wrist and it will subtle tap you when it has your answer, or to tell you if it didn’t understand. A small change, but it makes a big difference to the usefulness of the feature. You can now draw characters onto the screen to transcribe text. It takes a bit of getting used to, but it’s a nice way to quickly reply when your phone is out of reach. Reminders are now available on the watch, and stay on the screen for up to 8 minutes after you last used the app, so I can walk round the supermarket checking off my shopping list on my wrist. The watch now feels more useful then it did before, when I was only really using it for notifications and fitness tracking (which are still first class). On my smaller 38mm machine battery life still isn’t great. It seems to be slightly worse than before. Where I would have previously been at 25% at the end of the day, I’m now at 10%. This may well be because I’m using it a lot more now. I’ve long been in the habit of a post-lunch charge at my desk, so it’s not an issue most of the time. I’ve always been compelled by the idea of having a computer strapped to my wrist, accessible at any time. This ‘ambient computing’ experience is finally realised with watchOS 3. What is really needed now is a watch with it’s own cellular modem, so the phone truly becomes an optional extra. I could also configure it to show the remaining battery percentage, my favourite stock price, sunset time or various other tidbits of information. So what's the problem? The problem is i need to configure it every time. It's not just a case of setting a timer, and the watch automatically replacing the weather with the timer, I have to manually edit the settings each time (unless I save a different watch-face with each combination, in which case finding the right one would take just as long). Instead I should be able to say 'show me one of these things, depending on what's happening'. So if I've set a timer, show that. If it's going to rain, show the weather. If my battery is low, show the percentage. This would be a really cool addition in my view, and as far as I know it's not been announced for watchOS 2.